Every photo tells a story. This is the story about a man struggling with hard times going practically unnoticed on one of downtown Chicago’s busiest commercial districts. I don’t know who this man is or anything about his story, but I’d like to. He was a younger man, caucasian, he didn’t say anything and he kept his head down. He had a backpack, a Gatorade bottle and a McDonald’s cup along with the cardboard sign that he was holding. He didn’t seem dirty and seemed almost out of place in the homeless world. A posing impostor? Perhaps. Surely you could make at least a hundred dollars a day panhandling on the streets of Chicago with the right look, the right attitude, and the right location. Who knows. It’s not hard to find homeless men and women walking around the south Loop of downtown Chicago, often times congregating near the Harold Washington Library just a few blocks south. But to me, this man seemed to have a different background story than the others. 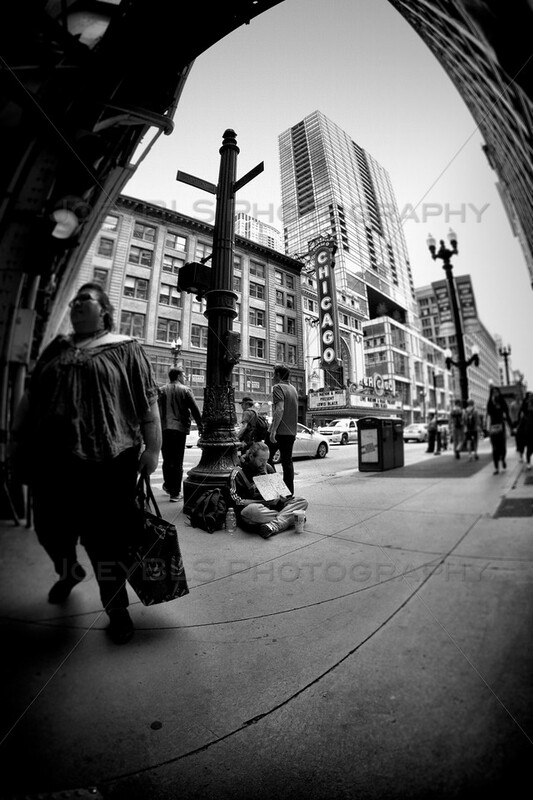 View my Chicago photo collection as well as more of my photography taken over the years. Unnoticed in Chicago by Joey B. Lax-Salinas is licensed under a Creative Commons Attribution-NonCommercial-NoDerivs 3.0 Unported License. Permissions beyond the scope of this license may be available at http://www.joeyblsphotography.com.